I went hiking up in the hills the other day and lost my way. It wasn’t too disconcerting because the hills they were a-rollin’, and I could see over the tops of ‘em without having to climb to the summits. I could peek over the tops of the peaks without sucking thin air. But that was from my viewpoint. There was an ant at the bottom of one of those hills who probably thought it was sitting at the base of the Himalayas. 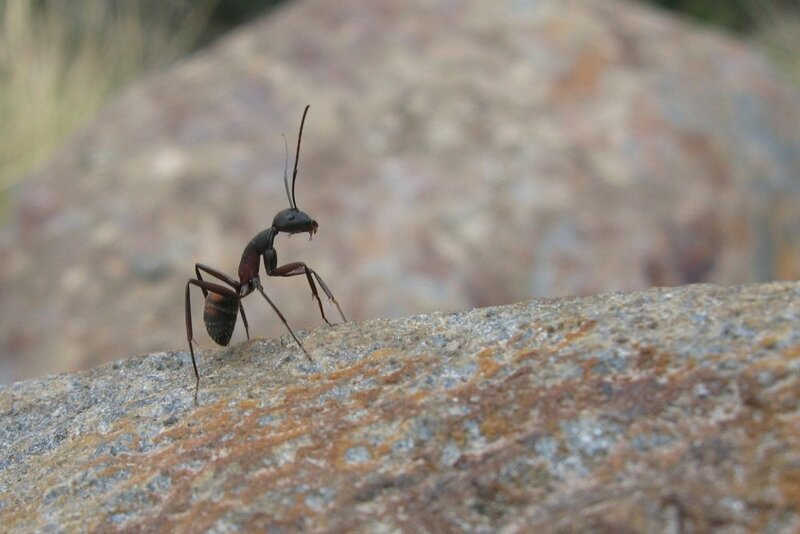 (In its idleness, does an ant sit or does it stand? And who says it was idle? Does an ant ever rest?) Marooned in a world swarmed with its own, without cerebration, without fear of unseen dangers, the ant runs on instinct, working in one long monotonous metronomic rhythm that almost looks like faith. We humans need changes in elevation. In the mornings when we wake up, if our cat dies or mews for love, if our best friend frowns or laughs aloud, if our child dies or was just birthed, if we meet a new friend who becomes a great friend, if the sun shines, if the sky rains, if our prayers are full of praise or full of blame . . . these hills and valleys and Himalayas are real and available. How would we know happiness if we had no sadness for comparison? this, we get to enjoy today’s rest without fear of one of those ginormous, astronomic behemoths of the universe accidentally (or purposely) stomping on us. In Christ’s rest, all that’s left for us to do is to take loving note of those around us: the quirky, the whimsical, the taciturn, the laugher, the crier, or the fact that any of these might be choking cloaked calls for help. Maybe the ants can learn from us. But I guess they wouldn’t be ants then, would they?